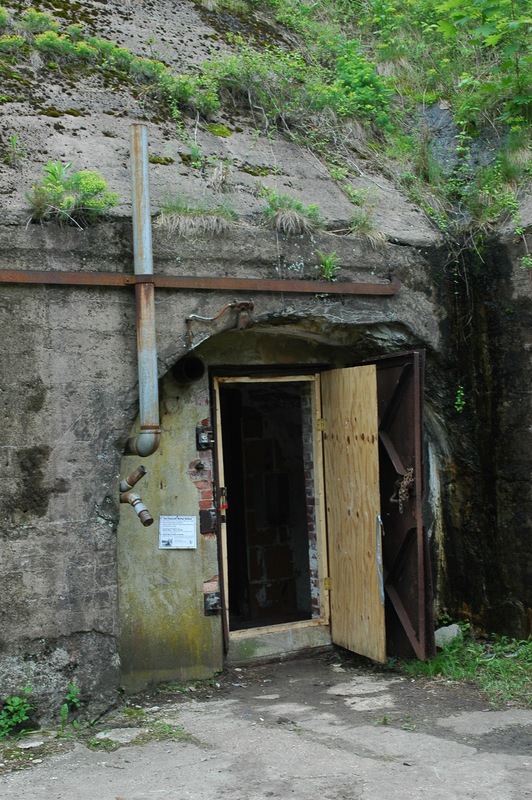 Each May, generally the weekend before Memorial Day, Sandy Hook's Fort Hancock pulls out all the stops for its annual Coastal Defenses Day. 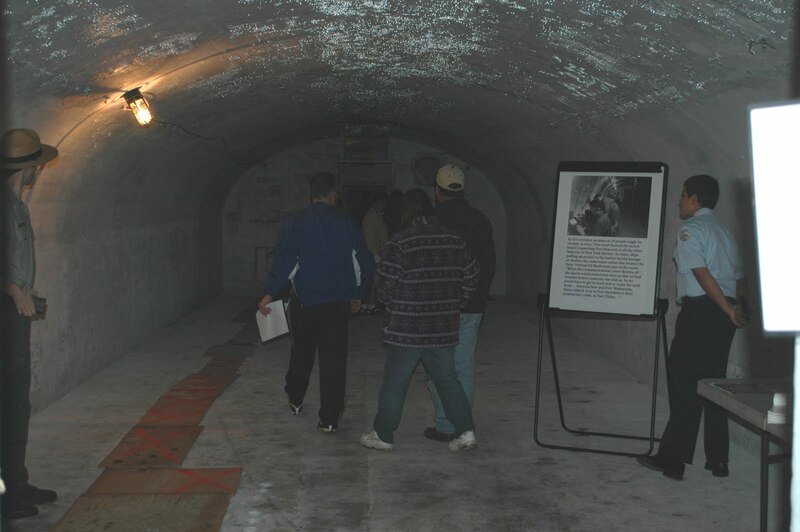 Celebrating the Fort's role in keeping New York Harbor safe from enemy attack, the National Park Service conducts tours and discussions of many of the defensive structures, much with the assistance of re-enactors from the Army Ground Forces Association. Indeed, if you didn't know better, all of the period uniforms in some places would have you convinced you'd stepped right into the early 1940's. Though none of Hancock's guns were ever fired in defense of the country, the fort played a crucial role in deterring Axis powers from attacking the New York area. It's known that several U-Boats patrolled the coast, but no naval or air attack was made, nor a serious threat incurred. Four of the defensive batteries were open for touring on Sunday, but my big goal was to get into the inner corridors of the Mortar Battery. On its own, the battery is regularly available for wandering, with its two rear gun pits easily accessible any time the park is open. Getting to the front pits and the innards, though, is a much rarer opportunity, and, in fact, the corridors that were open for Coastal Defenses Day hadn't been accessible to the public for decades. The Mortar Battery itself is one of the first fortifications built at the fort and is, on its own, nothing fancy to look at. However, in the early days of World War II, the army came to see its value as a strategic location for the Harbor Defense Command Post. From this protected location, the armed forces could manage all of the intelligence related to the harbor, including information coming via underwater cable from Fort Wadsworth on Staten Island, Fort Hamilton in Brooklyn and Fort Tilden in Queens. 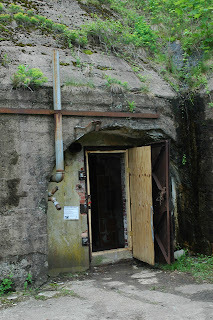 From the outside, the door to the bunker is unmarked and looks rather unassuming. Without inside information, enemy invaders would have no indication that this is where the strategic leadership convened. Entrance to the post was restricted to a select few, with sentries posted outside who knew by sight who was permitted to enter. There was no secret password, no secret handshake -- they just knew who was in and who was out. 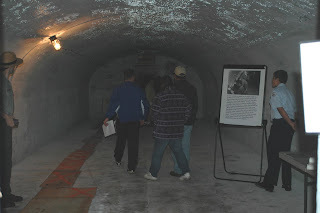 Before getting into the main corridors, personnel would pass through an airlock that would seal the bunker in event of a gas attack. maintained contact with the Harbor's other forts. The visitor today is immediately struck by how cold it is inside -- that steady ~55 degree climate you find inside caves. Right now there's nothing much to look at but a few photos and signs explaining what each of the rooms was used for, but you can imagine how frenetic the place would have been, had there been an actual attack on the harbor. It reminded me a little of Churchill's wartime bunker under the streets of London, especially when I read that the commanding officer had a bed in his office for use in event of an extended stay. Kilroy wasn't here, but apparently Robert was. 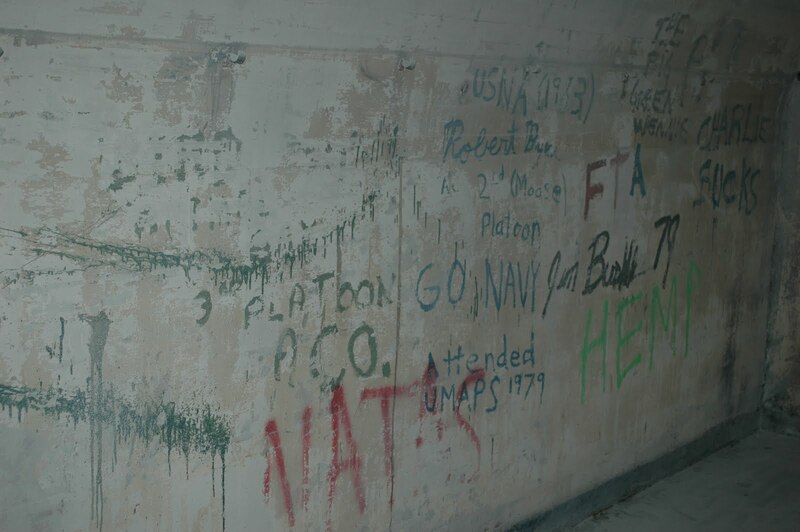 A thin whitewash covered most of the walls, but as we explored, Ivan and I also found signs of those who'd been in the bunker well after the war. Apparently the place had either been used at some point in the last 35 years, or someone had found their way in with little trouble. 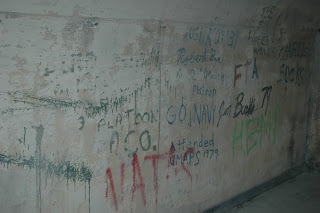 The graffiti we found had been placed after the Army transferred the property to the Park Service, but who knows what kind of arrangements they might have had for additional use of some structures. The Nike missile radar site and Batteries Potter and Gunnison were also open for touring, with plotting and gun loading demonstrations taking place at the latter, but we chose to skip them for the time being. Both are well worth a visit and open at regular intervals through the year. Check the Sandy Hook calendar for more information. 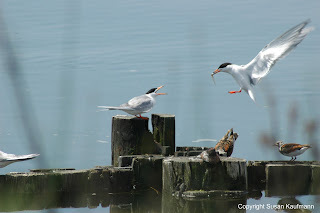 This past weekend's Sandy Hook jaunt was one of our classic birding/history mixed trips. Ivan had heard about a rare sighting of a male king eider in full breeding plumage at the north end of the hook, and the National Park Service was running its annual Coastal Defenses Day at Fort Hancock. Given how exhausted we were after the South Jersey jaunt, and the overcast outside, we got a bit of a late start, but fortunately that doesn't really matter when it comes to shore birds. When we got to our destination, we stopped first at New Jersey Audubon's Sandy Hook Bird Observatory to check the log for sightings. Was the eider still around? Apparently he was still somewhere at the end of the Fisherman's Trail, but according to another birder, there "wasn't much else." Well, one person's feast is another's famine. Off we went to determine what our own menu for the day would become. The Fisherman's Trail is at the very northern tip of the hook, accessible from the parking lot just to the west of the Nine Gun Battery. It winds past the small and decaying Battery Peck and the adjacent hawk watching deck (funny how they watch birds from Peck, don't you think? ), and then through the dunes to the shore. It's very sandy, with no firm base below, which means you're essentially spending about 15 minutes wading along with things shifting below your feet. It's not an easy walk, but it beats having to do the stairmaster at the gym. At the end of the path, you're rewarded with a broad beach littered with all sorts of flotsam, from driftwood to whatever plastic trash happened to find its way there. Substantial parts of the beach dunes are blocked off for the endangered piping plovers to nest, and the occasional human-built enclosures mark where some of them have chosen to raise their young. 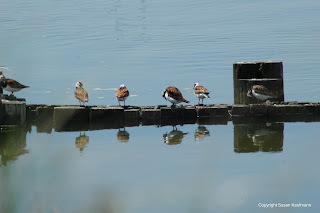 They're great little shorebirds, and as Ivan noted, they're pretty high up on the cuteness scale. Seeing them on the beach is always such a treat. The top of the hook isn't a bathing beach -- it's far too much work to get there -- but plenty of sport fishers will make the hike for a good catch. Just off the coast, plenty of fishing boats large and small anchor for a few hours, and the buoys marking the shipping channels are visible. On a good day, you can see Brooklyn and Staten Island along with the connecting Verrazano Narrows Bridge. In really clear weather, you might even be able to see a hint of lower Manhattan in the distance. Sunday, though was overcast and even a little foggy. Not a great day for sightseeing. We came upon a birder carrying a scope and tripod, returning from his walk. He told us that he'd seen two eiders just out of view of where we were then standing. Ah, good news! We walked along the beach looking for the elusive fowl both on the sand and in the water; an online report had included a photo of him nestled comfortably on the beach, so it was quite possible he could be anywhere. Alas, though, we were not destined to meet the king eider on this trip. It's the way it sometimes goes: you don't always see what you came to see, but you often still see something very worthwhile. 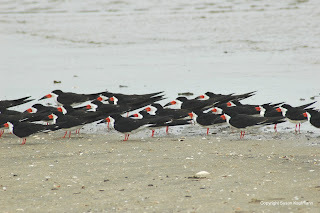 For me, it was another view of one of my favorites, the black skimmer. 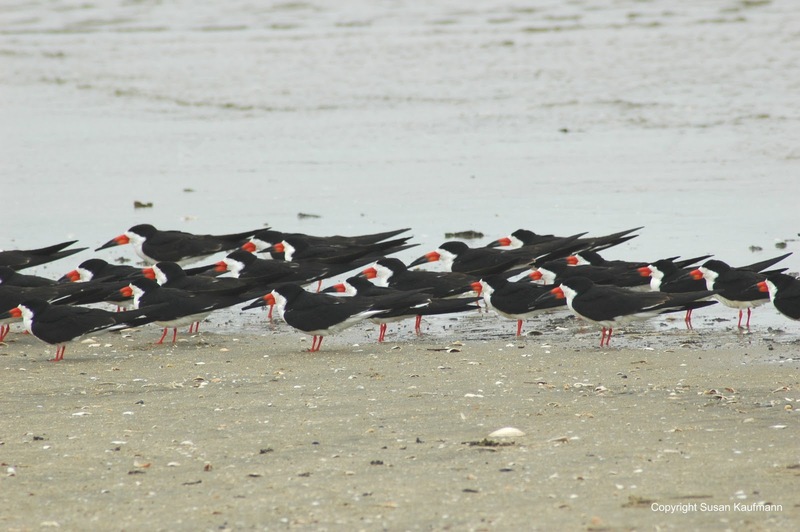 They tend to fly in flocks and then rest on the beach almost in formation. To me they look like airplanes parked on the tarmac, just waiting for their next flight. And of course, it's always fun to watch the smaller shorebirds dart their beaks into the sand for food, and then run quickly as the tide washes in. Looking through the grounded birds, Ivan noticed a couple of red knots, glad to see a few of this rapidly decreasing species. Maybe we didn't see the eider, but perhaps the knots were just as good, if not better. The birder at the Audubon office was wrong: there was 'much' out there. Running into some massive construction-related congestion on the Parkway north from Brigantine, we took the first available exit and ended up on Route 72 west. Nowadays, it's almost a reflex to grab the GPS to get the next best route, but in this case, we knew it was just going to put us back into the road mess we were seeking to avoid. Other than the traffic light-infested Route 9, there aren't a heck of a lot of other roads that link coastal South Jersey back to home base. It was a job that only a map could handle, as Ivan reminded me. I was riding shotgun, so he suggested I look in the glove compartment, as there had to be something useful there. I rattled around and found an official New Jersey map published by the state… for the Bicentennial. Yup, on the back was the characteristically bad photo of then-governor Brendan Byrne, and a classically colonial scene on the front. Ah, yes, New Jersey was the crossroads of the Revolution. Not surprisingly, while it showed the key mid-20th century roads, the map was just a little inaccurate after 35 years. Shadows of the proposed paths of Interstates 287 and 78 were outlined where there are now regular rush hour traffic jams. "This map is ancient!" I exclaimed. "Hey!" Ivan protested. "Some of those dirt roads are still in existence!" Come to think of it, we were in the part of the state where that's true, so this map was as good as anything else that might be hiding in the glove box. Who was I to talk, anyway? I was consulting a 70 year old WPA travel guide to New Jersey for roadside attractions. As we continued west on 72, I scanned the map, looking for an alternate route, I saw a familiar name. "Ong's Hat! We've gotta go to Ong's Hat!" of a good road trip destination. It's a funny name for a strange little town ... or lack of town. Among Jerseyphiles, Ong's Hat is both famous for its story and a prime roadtrip destination because it doesn't really exist anymore. Located deep in the Pinelands, it was a thriving little community during colonial times and into the mid 1800’s. According to legend, it was home to a dandy named Ong who was quite the ladies' man. His multi-dating ways apparently angered one of the local young ladies so much that she grabbed his silk top hat and tossed it into a tree in frustration. The hat was so noticeable and stayed in the tree so long that it became a landmark: "Make a right turn at Ong's Hat." Much, much later, Ong's Hat became the setting for a very strange supernatural tale that takes a variety of different directions, depending on who you talk to. The writer Joseph Matheny claims that it all started with a man named Wali Fard, who bought a few hundred acres of the Pinelands in the 1950’s. Along with a couple of anarchist lesbians (or are they lesbian anarchists? You decide!) and some runaways from Paramus (why is it always Paramus?) he started a cult called the Moorish Science Ashram. That’s not all that strange, but it gets better. Allegedly, the site held a vortex that led to an alternate universe, discovered by discredited Princeton physics professors who were somehow influenced by the nearby Fort Dix and McGuire Air Force Base. The proximity to the famed Lakehurst Air Naval Base probably didn’t hurt either: it was the site of the famous Hindenberg explosion. Through a series of experiments, the scientists found the gateway to another dimension, which they’d accessed through use of a capsule shaped like a human sized egg. I wouldn’t doubt that there were drugs involved, too. From a story like that, you’d kind of expect there were. Or maybe even hope… In any case, it’s the kind of story that makes the Jersey Devil pale by comparison. With this kind of information in hand, is it any wonder I got Ivan to steer the car to the traffic circle where Routes 72 and 70 intersect? Yes, like everything else in the Garden State, Ong’s Hat isn’t far away from a traffic circle, the original Jersey vortex. Trouble was, I can never remember which of the turns off the circle will bring you to Ong’s Hat, and it’s not as if there’s a sign to point you. And once you do make the turn, there’s a good couple of miles of solid scrub pine before you reach any sign of civilization. In other words, it takes a while to confirm you’re on the right path. Unless you’re very good at recognizing specific trees – not species of tree, the tree itself. Or unless you’ve got the GPS running, which we no longer did. After a piece, though, I realized we had, indeed, made the wrong turn, which created a small bit of frustration, but we worked it out and found our way to Ong’s Hat Road. And then zipped right through it, avoiding the vortex completely. In reality, the supernatural story was the product of some very active imaginations on the internet, and there’s nothing at Ong’s Hat now but the shuttered Magnolia Road Tavern. It used to be a biker bar, with bars on the small windows and the Tasmanian Devil and other Warner Bros cartoons painted on the walls. The tavern was for sale when I first visited in late 2009, and it’s still for sale today. If you have $155,000, an interest in vortices and a willingness to run a biker bar, it's all yours. As for Ivan and me, we'd already had a long day and we just wanted to get home. We'd have to leave Ong's Hat (and birding the surrounding pines) for another day. Now that the weather is reliably above freezing, it was really a joy to check out Edwin Forsythe National Wildlife Refuge in Brigantine this past Saturday. You'll recall that back in January/February we spent a frozen afternoon there, being dive-bombed by gulls. On an earlier trip, we'd seen an immature bald eagle and an elusive American bittern, but mostly we spent the day avoiding the bitter wind and being very cold. This time it was just plain beautiful -- sunny and relatively warm -- and it was a good day to check out all of the various environments at the refuge. If the predicted Rapture were to come, there were much worse places to spend one's final hours. It seemed that many other birders were thinking the same thing, so we basically saw where others were going... and didn't go there. On earlier visits, we hadn't spent very much time in the wooded areas or foot trails, preferring to take the marsh drive in the relative warmth of the car and then bop outside for a few minutes from time to time. This trip, we made some very productive walks about, finding a variety of songbirds and even a beautiful indigo bunting. And while we didn't see much in the way of mammals, other than people, we came upon a couple of tiny toads on the path. The marsh drive added quite a few shorebirds to the day's take, with a fair number of black bellied plovers hanging out with the ubiquitous gulls. And I have to admit that even as a big fan of great egrets, I was getting a little weary of seeing so many standing amid the spartina. All in all, Ivan logged over 60 birds (being lazy, I don't keep a list), not a bad take for a couple hours of observation. It's always good to get to the Jersey marshes before the insects get nasty. Mark your calendars: June 4 is Edison Day! What's that, you ask? Thomas Edison National Historical Park opens the gates for a full day of special events and exploration, all totally free of charge. I'll be there along with a host of other volunteers, helping the staff share the story of the world's most prolific inventor. Come on out and check on Edison's desk! If you grew up in New Jersey, you no doubt visited the site on a grade school field trip, seeing Edison's library and the heavy machine shop where his muckers put together prototypes and the machines that were needed to manufacture the successful inventions. Now you can see and explore all three floors of the invention factory, including the world's first audio recording studio and the place where the motion picture camera was invented. The heavy machine shop will be running periodically during the day, giving visitors a rare opportunity to see and hear what it was really like to work there during Edison's time. For as many times as I've been there, I've never seen them run, so I'm especially looking forward to that part of the day. Musicians will be on hand to be record on wax cylinder, always a popular event at the park. It's pretty cool to listen to a contemporary performance and then hear it played back from the cylinder, sounding like something recorded during the early days of the 20th century. The Edison archives will be displaying documents that trace what Edison and his team were up to in 1911 ... 100 years ago! Glenmont, Edison's 13-acre estate just a mile or two from the labs, will be open for guided house tours, with the garage and greenhouse open, too. If you're interested in concrete buildings, you'll be interested to know that both the garage and potting shed represent Edison's experiments in casting cement structures. An exhibit in the home's conservatory will track the many famous and obscure visitors who cross the threshold of the Queen Anne-style mansion. If you've ever wondered what might be in the basement of the house, come check out the home's new geothermal climate control system. It's a technology that Edison no doubt would have found totally fascinating. Finishing up the day, Glenmont will also host an evening ragtime concert with the Paragon Ragtime Orchestra at 6 p.m. There's even more stuff on tap...stop on by and check it out! First, the apology (of sorts). Last week's Hidden New Jersey post on the Battle of Connecticut Farms was the victim of a massive Blogger glitch. I was hoping it would return after the Blogger folks reset the website, but alas, it has not. Unfortunately, I didn't save it as a separate document, so I'll need to reconstruct it from scratch. It's a shame, too: I was really very happy with the way it turned out. Funny thing is, I'd tried to post a similar story on another blog a few years ago, and that post disappeared, as well. Perhaps the fates don't want the story to be told online? You really do have to wonder. On another topic, Ivan's World Series of Birding team spotted a grand total of 106 species during Saturday's event. (It would have been 107 had the rooster been permitted in the count.) Rainy weather kept the migrant count down, affecting the final number. I'm just happy enough that a find I made on one of my solo field trips ended up contributing to the count: the monk parakeets at Overpeck Park in Bergen County. The Galloping Hill Inn in Union is a classic, founded in the '20's at a confluence of roads aptly called Five Points. It's the quintessential hot dog and beer kind of place, and when I was a kid, it looked like something you'd find on some rural road -- whitewashed exterior with ordering windows on both the street- and parking lot sides of the building, and a porch with picnic benches. The ordering process is not for the hesitant: customers crowd the broad (8-10 foot wide) window to shout out their orders as the counter guys randomly call "next." Often chaotic, but efficient. There's also a small dining room with waitress service. I can't really offer any commentary on it since I've never actually checked it out. Like most road joints, atmosphere is half the experience at Galloping Hill. For years, the place was clad in whitewashed clapboard, eliciting the feel of a stand on a backwater thoroughfare. Sadly, they appear to be going for a diner look now, with enamel walls, chrome accents and faux-pressed tin ceilings above the porches. They've also totally enclosed the back-side counter area to create a quasi-interior seating area with benches and a dining counter for the walk-up clientele. That's a welcome addition in my book, as it gives you a quick option for those cold winter Galloping Hill visits. Fortunately, the quality of my standard order hasn't changed a bit: a 'complete' hot dog (kraut and mustard) and cheese fries with a generous amount of the tasty yellow stuff. Yum. This is a classic tube steak -- nice snap when you bite into it, no gimmicks, though in my opinion, the roll is better suited to a cheesesteak or chicken parm than to a hot dog. Everything always tastes fresh, and given the traffic the place gets, nothing sits for long, anyway. Five Points is a very busy intersection, so you can't really blame the Galloping Hill guys for moving the transactional part of the business to the back of the building for safety. When my sister and I first started going there in the mid-eighties, we'd eat our meals on the street-side porch and count the near-miss accidents. While we never actually saw a collision, we heard one once, first the screech of tires and crash of car against car, then the very loud string of obscenities expelled by one of the drivers. Jersey road food ambiance -- can't beat it. Okay, so it's not the Yankees vs the Mets, but one could say it's the Cardinals vs. the Orioles. Yes, this Saturday is the World Series of Birding, sponsored by the New Jersey Audubon Society. Given that we give a fair amount of attention to the state's avian visitors here at Hidden New Jersey, I thought it appropriate to give a mention to this unique event that raises both awareness and funds for conservation efforts here in the state. Essentially, teams of birders converge on the state to see how many bird species they can identify in a 24 hour period which, this year, is Saturday May 14. While some WSB teams will comb the state, driving hundreds of miles to find as many species as possible, others pick a specific geographic area, perhaps a given preserve or watershed. The really low key birders will stick to one location. I, for example, will spend an hour or two looking out my living room window with my cat, identifying whatever comes into our courtyard. I'm not expecting a big count there, but the best teams will see or hear more than 200 species over the 24 hours. 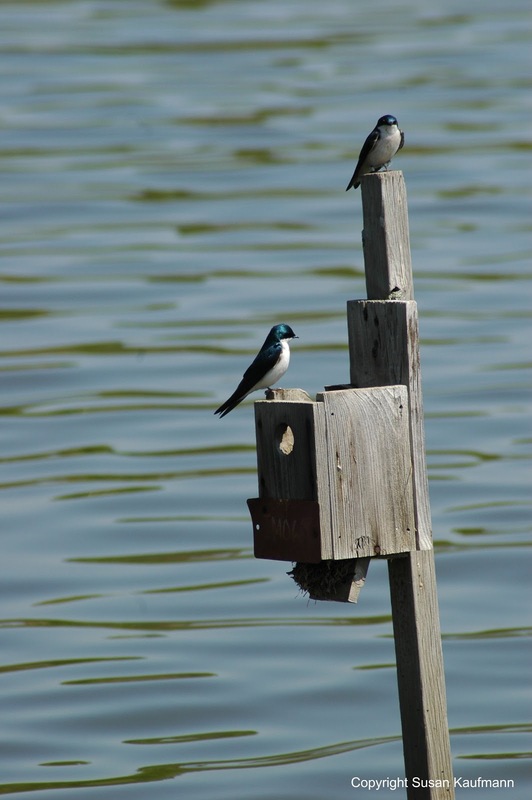 Given that New Jersey is a key location on the Atlantic Flyway, it's a key rest stop for migrating birds, much like the Vince Lombardi Rest Area on the New Jersey Turnpike. I'm obviously taking the easy route on this one, but Ivan's been busy flexing his optics and birdsong recognition as part of the Hackensack Riverkeeper team, the Hackensack RiverCreepers (never let it be said that birders don't enjoy a decent avian-related pun). They'll be spending the day combing the river's environs for any number of owls, raptors, songbirds, ducks, egrets, herons... you name it. If you're of a mind, consider making a per-species pledge, or even a single donation to support the cause. And certainly, if you happen to see a carload of very focused people wearing binoculars and seemingly racing to the next stand of trees, give them the right of way. I'm always rather pleased with myself when I can introduce Ivan to a new birding environment. It's fun to spot a particular bird before he does, but it's even better to bring him someplace he's never birded. That was the case last Sunday when we closed out a very eventful excursion with a stop at Watchung Reservation in Union County. Located between the first and second Watchung Mountain ridges, the Reservation is nearly 2000 acres of hilly and mostly wooded land, with a couple of ponds, a stable and the recently renovated Trailside Nature and Science Center that focuses on the flora and fauna of the area. It's also home to a deserted village which has had lives as a resort, a factory town and a Revolutionary-era farm. While the hiking isn't as strenuous as you might find in more northern parts of the state, it's a convenient place to spend a few hours on the trail if you live locally. Given we were already on Route 78 as we headed east from Phillipsburg, it was a logical stop. I've hiked Watchung many times, but I'd never focused much on the birds there, other than enjoying their songs as I headed down one trail or another. Given its acreage, I figured there could be some lesser-seen (at least for me) species enjoying a migratory stop-over, or maybe even nesting. On any given hike I wouldn't know many of them by voice or by sight, so why not have the Dean of Birdology identify them for me? We parked on Tracy Drive, across from Surprise Lake (surprise!) and started walking through the woods at the water's edge. While hosting a nice variety of trees, the path is reasonably level and free of potentially tick-infested brush. As you stroll, you'll also come upon a couple of rustic building foundations. These stone walls are what's left of the boathouse and bathhouse that served the lake for the first several years of the park's existence. Informative wayside markers provide information and photos of the structures to guide your imagination. So how was the birding? Not bad, overall. Though we saw a preponderance of robins and sparrows, we also found warblers including the black-throated green. I also got to see my first Baltimore oriole of the season, which was a nice balance to the orchard oriole we'd spotted at the Water Gap. For those who'd like to check out the route we took, it's the dark pink trail that runs on the eastern side of the lake, from the road to about 100 feet short of the spillway. Beware, though: this trail is mired in controversy. The actual trailhead is nearer to Trailside Center, and it skirts a moraine, passes by a copper mine and runs through the ravine below the Deserted Village, but at some point before getting to Surprise Lake, it just disappears. Some say that an organized group (of who knows whom) took it upon themselves to blaze the route without bothering to inform the county so it could be placed on the official trail map. In any case, take care not to get lost along the way: pick up a map at Trailside or carry a GPS with you to help guide you back to the established trail. 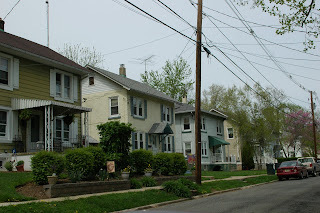 You might recall that earlier this year, we blindly stumbled around Phillipsburg in the futile effort to find an enclave of concrete houses built for Ingersoll-Rand by Charles Ingersoll and constructed with Edison Portland Cement. Never let it be said that I don't eventually find what I'm looking for, even if it takes a compass, pickaxe and night-vision goggles. is probably closest to the original look of these homes. Okay, so I got lucky. Not long after that initial visit, I found a chat board discussing the P'burg houses and left a message asking if anyone could provide an address. About 10 days ago, someone responded, telling me that she'd found the enclave near Gino's Market on Congress Avenue. Taking a look at a satellite photo of the neighborhood and comparing it against a street map I'd found in an old book about the houses, I determined that the Gino's neighborhood and the Ingersoll enclave were one and the same. Thus, after our Water Gap excursion on Sunday, Ivan and I found ourselves driving back roads to get to Phillipsburg's Valley View section. Honestly, I wasn't expecting much. Last year I'd attended a Park Service presentation on Edison's concrete houses, and the P'burg houses were represented by a dingy photo of a depressing house that appeared to be wrapped in tar paper. What we found when we got there was pretty cheerful by comparison. The Valley View folks have commemorated the Edison connection in a nearby park, and the area is pretty nicely landscaped, overall. While the houses are fitted cheek-on-jowl in 0.1 acre lots, they've been customized by their owners over the years, sporting a variety of colors, brickfaces and even vinyl siding. I have to admit I liked the original stucco the best, but I totally understand the desire to individualize what used to be totally uniform buildings lining both sides of three or four streets. Along the way we saw a larger though still compact commercial building that, no doubt, was originally built to be a community center. We were fortunate to be invited into one of the houses to take a look around, and true to the billing, these are sturdy structures. They're also very small. As soon as you walk into the door, you're basically in the living room, with a staircase to one side and a shallow sitting room to the other. Immediately behind the living room is a shallow kitchen, and to the other side is an elevated porch that leads to the backyard. Ducking as not to hit our heads on the ceiling, we climbed the stairs to the second floor to find two small bedrooms just large enough to accommodate a queen-size bed. There's also a shallow front room that maybe could accommodate a small home office. In brief, you'd definitely have to take careful measurements of any furniture you'd buy for the second floor. That, or plan on getting it flat shipped from Ikea, build it in the room you'd use it in, and be prepared to break it apart when you move. When Edison first envisioned the concrete house, he saw it as a replacement for slum dwellings, an inexpensive alternative that the average worker could buy for just $1,200 (as any real estate agent would tell you, comparing your house with a slum isn't likely to attract many buyers). Ingersoll-Rand saw them as efficiently-constructed housing for laborers working at its nearby factory. Nowadays, I'd venture that they're considered starter housing for young marrieds or singles who want to build equity or would rather have detached housing than a condo. Even as an Edison geek, I'd shy away from the opportunity, though. Just too claustrophobic. Want to learn more about Edison's many experiments? Check our our stories on his developments in iron ore production, the first town to be fully electrified, his Menlo Park electric railroad, and his West Orange invention factory. You can also learn why his 29 room mansion was a real steal. Ravenous after exploring the birds of the Delaware Water Gap, we set the GPS to our next destination and agreed to see what the fates would present us along the way. I drove a bit too quickly along rural Route 46 in Warren County, meaning we missed an opportunity to roll into a rustic drive-through somewhere south of Buttzville. Ivan declined my offer to turn around, noting that something else would make itself known soon enough. Knowing how rare it is to find a place along 46 on that stretch, I had my doubts, but then I also wasn't really sure what route the GPS would take us on. Faith is sometimes just a horse with wings. Besides, if the talking road map was right, we'd be in Phillipsburg within a half hour, anyway. Things started looking up when we got off the 'main' road and found our way to Belvidere. It's the Warren County seat, so there had to be good options there, right? We found it, just a few hundred yards down from where the Pequest River feeds into the Delaware: The Original Uncle Buck's Diner. With visions of a tasty lunch and John Candy dancing in our heads, we quickly found a parking spot and walked on in. Uncle Buck's is the classic storefront diner/luncheonette, but half cantilevered over a spillway on the rushing Pequest. We were hoping for a river-view table and got it, as it was a little past the lunchtime rush and the only other patrons were a few couples of older folks socializing at a corner table. While it's not a classic manufactured railroad-car type diner, Uncle Buck's seems to be a close spiritual cousin in its layout. Everything's there, just kinda mushed in, as Ivan found out on a trip to the restroom. In getting there, you walk right next to an industrial-grade stove/oven, down a short corridor past the dishwashing station. Without intending to, you could very easily become part of the operation of the place, just by making a wrong turn. But, I'm getting ahead of myself. We seated ourselves and started leafing through the menus that were thoughtfully already on the table. They weren't huge but had all of the diner staples. Breakfast all day? Check. Happy Waitress special? Check. Burgers? Check, check, check. They even had a burger special that included the always-desirable Taylor ham as a topping. I was half tempted to order the Happy Waitress, but then our human waitress showed up and seemed to be channeling all the happiness in Warren County. Boy, was she cheerful! Instead, I went for the bacon cheeseburger, Ivan got a Swiss burger and we split an order of gravy fries. Yum on all counts. Both of us ordered our burgers cooked medium, and when Ivan lifted his off the plate, it dripped a pleasant few drops of beef juice. Looked a lot like the way I generally cook mine at home. When I bit into mine, I found the center was cooked just enough, with a little bit of pink still showing. And instead of being melted on the patty, two slides of cheese were placed on the insides of the bun. Only thing it could have used was some lettuce and tomato, but then I might have inadvertently not seen the deluxe version on the menu. The fries came as we were enjoying our burgers. Straight-cut versus crinkle cut, they stood up nicely to the lumpy and very flavorful gravy. Yeah, the bottom-most fries were a bit mushy, but that's to be expected after being smothered. To sum up, it was a satisfying meal and Uncle Buck's is a great find we'll keep on the short list for future visits to the area. After all, we'll need to grab another hearty lunch after visiting the shoe tree oak. With spring migration in full force, it was clear that this weekend's jaunt had to include a pretty serious birding component. 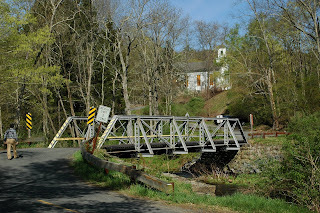 Wanting to get some distance and history into the equation, we found ourselves headed up State Route 23 and then along back roads to Stokes State Forest and the Delaware Water Gap National Recreation Area. The weather, sunny and seasonably temperate, supported a full day outside in nature. Ivan was looking for some new birds to add to his list for the year, and I wanted my customary dose of abandoned history. I'm accustomed to getting to the Water Gap from Interstate 80, taking the last exit before Pennsylvania, but I can definitely see the benefits of reaching it from the east, rather than the south. Rather than racing the 18-wheelers, you're gliding through small towns along two-lane roads, small businesses and ultimately, plenty of wooded acreage. Our first stop was Tillman Ravine, just at the western end of Stokes. As you pull into the small unpaved parking lot and leave your car, you can already hear the water rushing through the ravine bed. 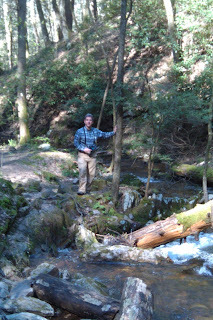 A brief hike through the hemlocks will bring you down to the water where it cuts through this seam in the earth, and you can easily traverse the stream a few times by way of sturdy plank bridges. Unfortunately I didn't have the good camera with me, but take my word for it, this is quite a nice place to wander and maybe sit for a spell and meditate with the sound of the current passing you. Doubtless there are a good number of birds in the area, too, but with the gurgling water noises so prevalent, it wasn't easy to hear anyone singing, so we were on our way to our next stop. Ivan had already told me I'd be surprised how close Tillman was to Walpack Center, and he was absolutely right. 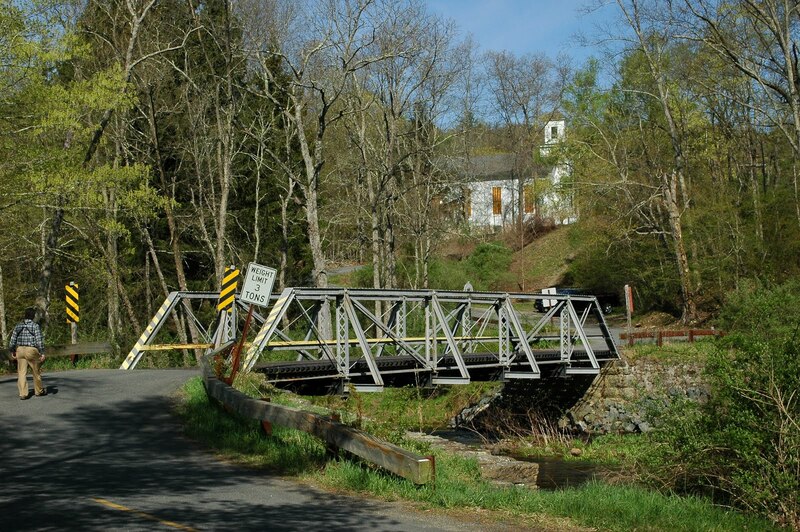 Normally I'd reach the small unpopulated village via the NPS road and then drive down Main Street to the one-lane bridge below, but this time I only knew we were approaching because I could see the village church on the hill that overlooks the bridge and the Flat Brook it traverses. I parked the car at the side of the road, across the bridge from several SUVs that belonged to fishermen who'd already waded midstream to their prime trout spots. Our first stop was a grassy meadow lined with trees and a broad, forested hill in the distance. Ivan was able to spot a few species but for the most part the birds were hiding out, content to sing but not be seen. Contrary to the old bromide about children, birds should be seen and heard. Yes, their tunes were beautiful and a fine accompaniment to a refreshing spring morning, but hey, we'd like to see some feathers, too. The prairie warblers were particularly frustrating -- I enjoyed their song of buzzing notes on a scale, but I really would have liked to have seen some. I did, though, spot what we thought might have been a bald eagle, soaring in the distance. Now, just a few words on Walpack Center, which appears, to the unknowing visitor, to be a total ghost town, complete with church, schoolhouse, post office and gas pump. This was, at one point, one of New Jersey's hidden mountain towns, but became desolate when the federal government started on plans to build the Tocks Island Dam across the Delaware River in the early 1960s. The project, designed to manage downstream flooding, generate hydroelectric power, and create a massive recreational lake, required thousands of acres of land that had been occupied by dozens of farming families, many for generations. Depending on which reports you read, the government either declared eminent domain or strong-armed the residents off their property, leaving virtual ghost towns to be torn down before the river was dammed and the area was flooded. Ultimately, a combination of factors stopped the project, which was deemed as both geologically unwise and unfair to those who had lived there. The government land was transferred to the National Park Service in 1965, creating the Delaware Water Gap National Recreation Area. 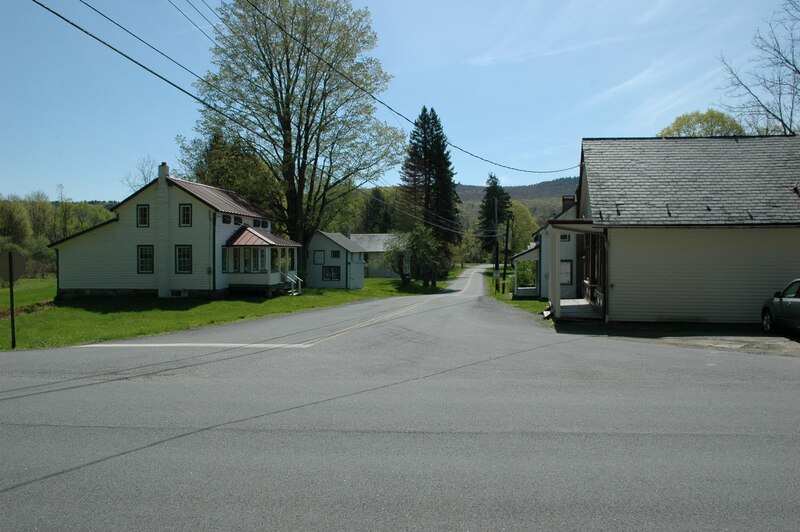 Today, Walpack Center is a clutch of whitewashed buildings, including one that's used as a rarely-opened museum, and another that's occupied by a Park Service employee. As we found out, it's also a luckier spot for birds than the meadow we'd been checking out. All on my own, I spied a woodpecker bopping around in the upper branches of a tree, just before he popped into a nesthole. We also saw a nice collection of warblers in a wooded area, while standing on a stairway outside the village church. Things were looking up. Satisfied we'd probably seen what the village had to offer, we started wandering south on the Park Service road to another spot next to a barn. Ivan had seen cerulean warblers there on a previous visit and while there was no sign of them when we were there, the songs in the air promised some really cool sightings and totally new birds for my life list. Just a few minutes after we'd gotten there, an orchard oriole stopped by on the branch of a tree just a few feet away. Very cool, but Ivan was on the lookout for an even more striking bird we could hear high up in the next tree. It was just a matter of finding it without spooking it. And... then, there it was, perched among the fresh young leaves of the tree: a scarlet tanager! You could see him, plain as day, bright red body with black wings. (Boy, do I wish I had the camera and the right lens.) What a treat! Though he was somewhat obscured by the yellow leaves, he hung out for a good while, allowing us to get an extended view of him. So, with those successes fresh, we drove back down Old Mine Road, checking one other spot (no luck) and keeping the windows open to listen for other bird songs on the way. There were likely other birds at other locations, but our stomachs were rumbling and we needed food pronto. We were on the way to our next stop.